22 I WRAPS I 2015 B u s i n e s s & s a l e s conveying this to your client can be one of the most challenging parts of your business. We always tell our students and sales staff to produce a quality product that impresses your competition. Remember, once you lower your pricing it's hard to charge more for the same product on down the road. I also highly recommend requesting that your clients visit your facility. Let them meet the staff, see the printers in action, and hopefully a project or two going on while they are visiting. 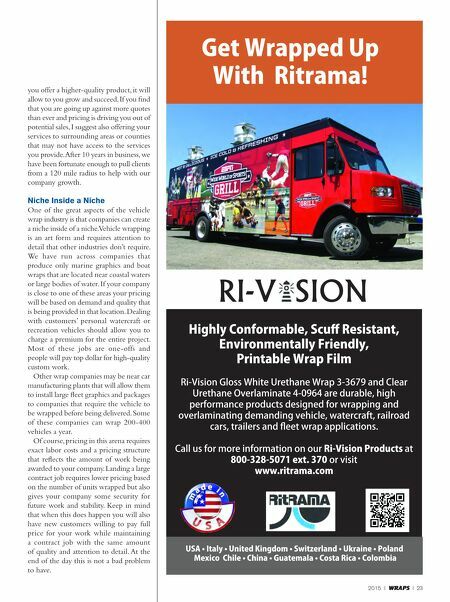 Seeing all the parts of a working wrap shop really sells the customer on what your company can provide for them. 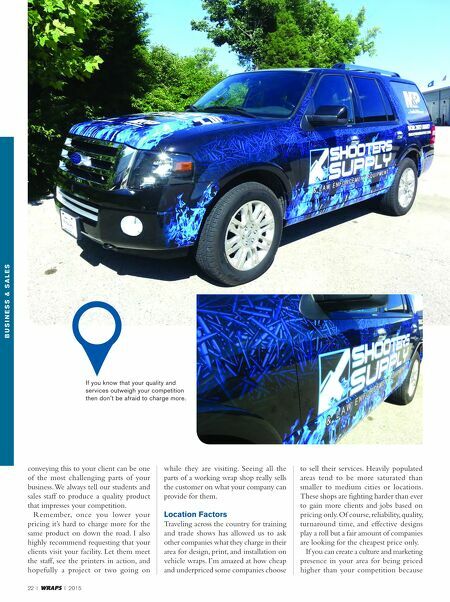 location Factors Traveling across the country for training and trade shows has allowed us to ask other companies what they charge in their area for design, print, and installation on vehicle wraps. I'm amazed at how cheap and underpriced some companies choose to sell their services. Heavily populated areas tend to be more saturated than smaller to medium cities or locations. These shops are fighting harder than ever to gain more clients and jobs based on pricing only. Of course, reliability, quality, turnaround time, and effective designs play a roll but a fair amount of companies are looking for the cheapest price only. If you can create a culture and marketing presence in your area for being priced higher than your competition because If you know that your quality and services outweigh your competition then don't be afraid to charge more.